Experience easy styling and storage with the Sedu Revolution Lite Professional Hair Dryer; an ultra-lightweight hair dryer that offers a salon-worthy blow dry, yet boasts a compact design. Created with the same features as Sedu’s best-selling hair dryer, the device utilises 1250-1600W of power, which dry locks quickly and efficiently, in order to reduce styling time. Featuring six speed and temperature settings, the hair dryer delivers enviable and professional looking results, whilst reducing the occurrence of frizz and static. Finished with a patented, ergonomic handle to improve comfort during use, the compact hair dryer is ideal for everyday use and perfect for on-the-go. 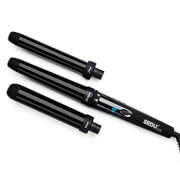 Ceramic componentry reduces frizz and static by 90%. Six speed and temperature settings. Patented ergonomic handle for ultimate comfort and usability. Cold shot button to lock in style.